IMX, Capstone and Graduation: AHH! Oh my god. It’s finally here. We’re all scrambling like mad to put final touches on our capstone projects – graduation might only be a few hours away, but like this program, we have to focus on the here and now, and that’s capstone. Months of work, lots of ideas and of course, revising and refining those ideas, went into each one of these projects. Today is IMX, our program’s exhibition of student capstone work. We finally get to show our projects — to our friends and family, but also to our professors, related faculty and each other. One of the cool things about IMX is that us students are in charge of the whole thing. We pick our groups – PR/Advocacy, Space, Event Management, Web, Reel, Social Media, Advertising, Project Management – and then we go off and work to pull it off. We curate the guest list, design the posters, mail out the invitations, code the website, film an introductory video, plan a communications strategy, and organize the layout of the projects. IMX underscores the iMedia program — multifaceted, hands-on, and wide-ranging. Our capstone projects follow this approach. Several students designed interactive iPad magazines. Nita Wrenn plans to launch hers, Zoo Babies, this summer through Apple’s Newsstand app. Zoo Babies focuses on one zoo animal family – this time it’s monkeys – and offers videos, articles, slide shows and other information based around the family. Beautifully designed, Nita’s project looks like it can be the prototype for many other interactive tablet stories. Ruth Eckles created Piedmont, an interactive magazine that focuses on the things that make this region of North Carolina special, with this issue concentrating on edible wild plants. She interviewed locals in Alamance County with ties to horticulture. Cory Watson’s iPad magazine is titled Always Ready, which attempts to tell the story of North Carolina’s National Guard. Like Eckles and Wrenn, Watson visited with members of the Guard and captured photos, audio and video to tell the organization’s story. Some students preferred to tell an organization’s story through a website. Dioni Wise used WordPress to build a website for the Greensboro chapter of Sisters Network, which is an organization for black women who are breast cancer survivors. Dioni followed a strategy recommended by many of our professors in using common themes in her work through the year. For her final storytelling project, Dioni did a microsite and a video interview with one survivor, Jill, and she did a case analysis for management on breast cancer support organizations, and two infographics – one interactive – for design class last semester. Kelsey Sullivan’s work is similar in execution. The resident equinofile focused most of her projects all year on horses, and she was the first one in our class to know what her capstone project was going to be – an interactive website that aggregates all of the state’s horse-related nonprofits. Kelsey had a vision way back in October that she never wavered from, and she’s spent the past eight months driving all over the state to capture the passion horse lovers share. Renee Robinson has also spent much of her time in iMedia focusing on one of her passions – music. Her capstone, Simply Vibes, is meant to capture a small fraction of the conversation on why people love music so. Simply Vibes has a strong social component, too, integrating Facebook, Twitter and Instagram (Renee’s fave). Her idea was inspired by an assignment in design class last semester, Conversations on Design, where designers spoke in short segments on what design meant to them. Renee’s passion and diligence led two major music groups of which she’s a huge fan – Portugal.The.Man and Bassnectar – to participate. We can still here Renee’s squeals when she found out. Iris Maslow has spent the past five years living in Raleigh, and her passion for the city is reflected in her capstone project, an interactive map of the city. In her project, she aggregates social media feeds about locations in the city, so that users can really get a sense of what’s interesting about the place. Anna Davis might have the most interesting and nontraditional capstone project. Using the open-source coding language Python and the single-board computer Raspberry Pi, she built Share Booth, a photo booth where pictures are sent automatically to Facebook. Inspired by experience-driven social media marketing, Anna’s Share Booth will be live at IMX and will likely be one of the highlights of the event. Another anticipated capstone is Will Neff’s “Green,” an interactive film he shot partially when he was in Las Vegas over Spring Break. Told completely through the second person, the viewer becomes the protagonist. Every decision the viewer makes affects the plot, which has anti-drug themes set against a heist. Other capstones of note include Benjamin Robinson’s take on his alma mater’s bookstore, Audra Macri’s redesign for the Wheeling National Heritage Area website, Marshall Beringer’s database for video games, Alan Buck’s website and business plan for his own media consulting business, Southwood Media, and Ashley Deese’s The Science of Nature Presents, an interactive website featuring interviews and educational content based around her undergraduate research on melatonin, a naturally occurring compound that affects sleep. We’re all excited to see the work that everyone has done, especially because so many followed personal passions and learned new tools in the process. IMX truly shows the diversity of the program and its inhabitants, as every year the exhibition continues to blow minds, even our own. Converge was so much fun! 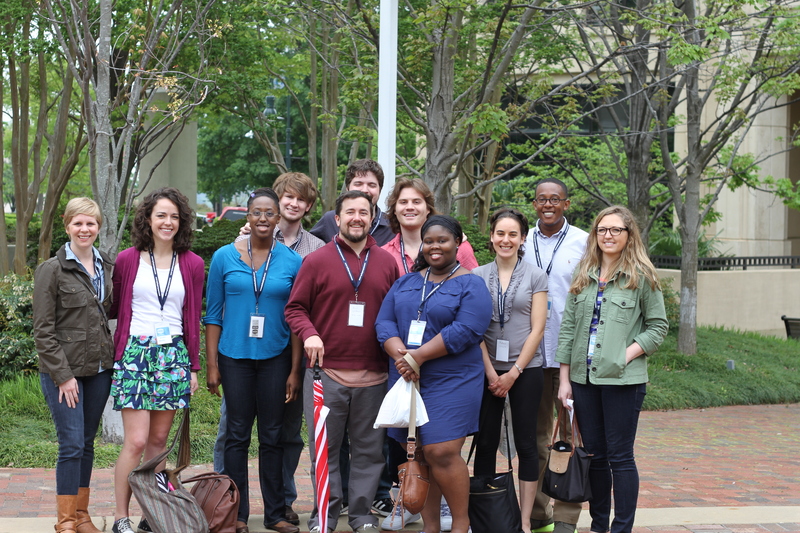 I, along with eight other students — Dioni Wise, Audra Macri, Will Neff, Cory Watson, Marshall Beringer, Rachel Brent, Benjamin Robinson and Katie Nolan — were selected by our professors in the fall to attend ConvergeSE, a web development conference in Columbia, SC, this past weekend. Along with Brad Berkner, we mingled with designers, front-end developers and coders. Unlike most other conferences, the speakers here generally gave an overview of their career and their work. But it didn’t seem completely self-serving — the vibe was more inspirational, pushing us to learn and take chances. Some of us iMedia folks, including alums and faculty. 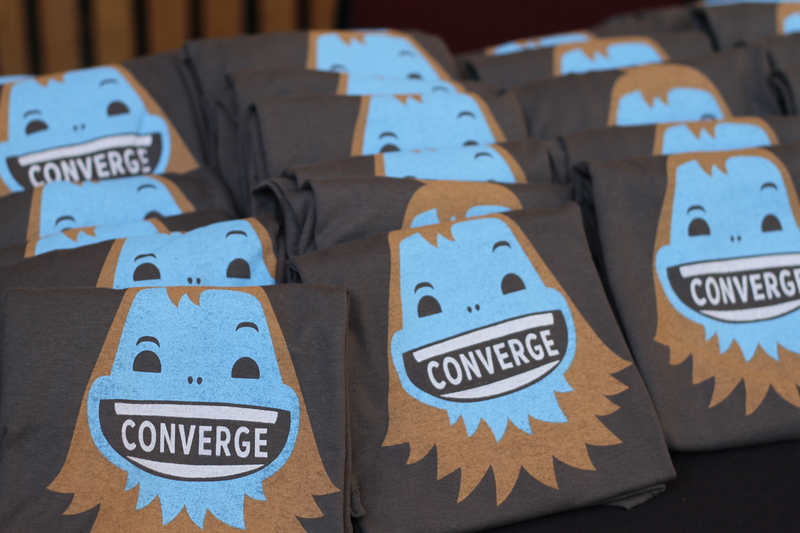 Converge SE had panels on development, design, front end, mobile and business, and we all scattered among those. One drawback was that neither the brochure nor the website had descriptions for any of the panels, so everything was a crapshoot. I lucked out on a “TBD” design talk by Mig Reyes, a designer at 37Signals who reiterated that design was a process and that we shouldn’t be afraid of the ugly — ugly is what gets us to the good stuff — but some of us ended up stuck in panels that weren’t as riveting, reiterating old concepts or just plain not being useful. But in the end that didn’t matter. Most of us agreed that even if we didn’t learn a lot, we certainly had fun. The highlight was definitely “Tall Tales From a Large Man,” a traveling talk by Aaron Draplin, who’s done design work for the Obama administration and for Field Notes, among many others. His story illustrated exactly what hard work and luck and risk take you — around the country, doing great, interesting, fulfilling work and doing it your way. There was another Obama employee — Josh Higgins, who was the reelection campaign’s design director. He underscored a lot of the principles we learned in iMedia — not just usability and design, but research, understanding your publics, and test test test. There’s a reason why Obama’s campaign was seen as the cutting edge: it used data to inform every decision, and everything was tested. Even just kerning the letters in the “Forward” logo took two days to do. Both Higgins and Draplin were big names with an impressive body of work, but none of us knew that until they spoke. Just seeing their work and hearing their experience was something in itself — an opportunity, exposure to something we didn’t realize was out there. This reinforces another strength of the iMedia program, the opportunities we get to mingle with others across all different facets of interactive media and learn about things we never would have encountered on our own. The conference was so much fun that I began to think about attending next year, even hitting up other conferences — an idea shared by some of my fellow iMedia attendees. This is the first year that iMedia students attended, and it’s definitely something that future students, if they get the opportunity, should do. Sometimes it seems that capstone gets all the love. Well, not quite. It certainly seems to get the most press when it comes to talking about the program. But the dirty little secret of second semester is that we have other classes, and they take up a lot of our time. Only two students among our group of 26 are taking an internship this semester, but even they take two classes outside of capstone. While our fall semester was regimented, our spring semester is made up of options. Essentially, every class outside of our capstone is an elective. This year, we had five choices: Application Development, Media Management and Economics, Intellectual Property Law, Public Opinion in New Media, Multimedia Storytelling, and the Converge Practicum, which was admission-only. The nine students who secured a spot will be heading to the Converge Southeast Conference in a month. Under the direction of Brad Berkner, the Converge students have been working on a campaign to raise awareness of the iMedia graduate program to Elon undergraduates. We surveyed undergrads to see how they found out about events on campus, what technologies they used and what they knew of the iMedia program if they had heard about it, as well as interview alums to see what their thoughts were. We took this information and began to brainstorm some ideas that would describe iMedia in an accurate yet compelling way, designing logos and shooting footage for a 30-second clip that will be featured on a one-page website later this semester. We have started presenting workshops to undergrads on topics like basic web design and search engine optimization. Harlen Makemson’s Multimedia Storytelling class is largely a workshop, where students work on a different open-source tool every few weeks to create short stories. A part of the class is to identify and share other tools, resources, and examples of digital storytelling. There is so much great stuff out there – highlights have included the wedding site of Jessica Hische and Russ Maschmeyer, Coal: A Love Story, Interactive Narratives, and the UNC Digital Story Lab. We have discovered that there are so many different ways to tell compelling stories, and that each tool has its strengths and weaknesses. Most of the new tools tried in class so far – Zeega, Meograph and Mozilla’s Popcorn Maker – are only a few months old, and are still very buggy, much to our consternation. Public Opinion in New Media might be a theory class, but Professor Kenn Gaither is all about application. Despite freaking everyone out by having a midterm and a final (! ), he tests us on concepts and challenges us to put them into practice. To illustrate social proof, groups of students slowly had to go outside and stare at the flagpole, while others recorded actions of passersby – to see how others would react. He also gave everyone 45 minutes to come up with a strategic campaign for the National Sleep Foundation, and we had an enjoyable discussion on the PBS Frontline special The Persuaders, all about the advertising industry. Within a week of viewing the film, Slate published an article discrediting one of the featured leaders, French marketing executive Clotaire Rapaille. How’s that for relevant? We’ve also had passionate discussions and analysis around coverage of issues in the Middle East and in India. Considering we all barely passed his first-day quiz of basic international issues, we’re all glad to be exposed to such interesting and topical content, making our class that much better. Intellectual Property Law was an intense half-semester course, where students were given a survey of communications law — copyright, trademark, patent, privacy, fair use and internet piracy. This class was anything but boring — we got to make our own syllabus, and every class offered a different shape configuration of seats. Like Professor Gaither, Brooke Barnett made sure that we could apply our understanding of the laws and apply and interpret them. We had to think about where we stood on issues, and some of us were surprisingly conservative or liberal in how we applied them. Like Public Opinion, this class was discussion-based, but the cases were very interesting and the goal was for students to feel comfortable in understanding how to use content. Media Management and Economics is co-taught by Connie Book and Jack Stanley, a 45-year executive at Time Warner Cable, now retired. Each session, he goes over current events of the past few days, as we discuss shifting television patterns and greater reliance on mobiles and tablets. The bottom line for us, whether we will be content creators or managers (or both), is that everything comes down to money. That might be obvious, but for many communications majors, it’s worth repeating. For a good portion of the semester, we will be focusing on one case study: the Google Fiber broadband push in Kansas City. Being iMedia students, we are often so surrounded by technology and live this life so fully that it’s hard for us to sometimes understand that there are people out there who have no interest and see no use for something we consider so necessary: the Internet. Google plans to expand broadband – high speed access – to areas that do not have it, for an affordable price. The company picked Kansas City (both the Missouri and Kansas locations) because they felt it was a real growth opportunity. And last but not least, students got Google Analytics certified. We are all very excited to put this on our resume, as we know how important metrics are to understanding the role of content and audience to a message, thanks to our professors! With all the talk of mobile, iMedia would be remiss if it didn’t offer a class on application development. Taught by Brian Walsh, our HMTL and CSS instructor, his Application Development class first made web-based applications — essentially websites designed for mobile phones — and then geolocation apps, where they were able to detect a user’s location, add custom points, and populate the map with nearby businesses and landmarks. We will now be accessing APIs, which means our applications can power the camera on the phone, and have begun working on final project ideas, where everyone will make a very simple app showcasing some aspect of basic data, like pictures and descriptions. While classwork this semester is just as intense and consuming as last semester, we seem to be enjoying it more, and it’s not because graduation is on the horizon — that makes us even more stressed — it’s because we truly love our classes. We’re working on topics we’re interested in and exploring tools and mediums we like. As a bonus, all of these classes have in some way dovetailed with our capstone or our career ambitions, as professors try to tailor their assignments so we can pursue our own interests. Both the theory and production classes have turned out to be valuable in one way or another — not a distraction from capstone, but an enhancement. I have been fortunate in the past few days to be able to talk to several iMedia alums on their thoughts on the program, now that they have some distance from it. By far the iMedia program’s biggest strength and weakness is its 10-month structure. Yes, we get out fast compared to most other master’s programs and we certainly work hard, but as many of us are discovering, it’s not enough time to really master a tool or a technology, to fully grasp all the fundamentals. For many of us, it’s the first time we’re really exposed to design principles or how to edit photos professionally, and we may not have had the opportunity to explore as much as we wanted throughout the school year. iMedia is very much an interdisciplinary and overarching program, introducing us to a lot of things in a short time. In looking at other master’s programs that cover one aspect of the iMedia program (art, design, journalism, communication, marketing, web development, digital media, branding), many of us discovered that what makes iMedia unique is not just its structure – 10-month programs aren’t that unusual anymore – but that it is so broad. Most other graduate programs that touch on “interactive media” – however that term is defined – are siloed, very specialized. The key is to make the degree work for us. Allie Boardman ’11 suggested twisting the degree to emphasize the portions of it that fit best with what we want – if you want a tech job, focus on that aspect and downplay the theory, while those interested in strategy or project management emphasize the holistic media approach and the more traditional graduate classes. You won’t be a master unless you go outside of what you’re being taught, she said. Several students have already gotten that message, working on projects and gigs outside of schoolwork to gain greater familiarity with something of interest. For Anna Davis, that means working on web design for outside clients. “The only way I know how to learn is by doing,” she said, adding that with outside projects, you don’t have the same type of deadlines as you do in an academic setting. Others pick up cameras and recording equipment, trying to integrate photography or film production into a jam-packed schedule, or design and code websites for interested parties. Some people take leadership roles, looking to become project managers. Allie is in a project management role, and she says the well-rounded nature of the degree means she understands the process and work that goes into each element, adding that she can communicate between all the parties involved. Sometimes we do get an opportunity to explore something we’ve always wanted to do for projects outside of class. iMedia students plan our exhibition of capstone work at the end of the year. I finally get the chance to use social media for a real cause, something my previous employers weren’t interested in, while Ruth Eckles and Audra Macri get to produce the videos that will grace the website that Rachell Carroll, Jake Amberg, Madeline Chapin and Will Neff get to build and design. All of them have indicated their interest in these areas and many of them have worked on outside projects to build up their production portfolio. Each of us can add these experiences to our resume and can continue to hone our skills in these areas after graduation. Jackie Hartley ’11 echoed that the degree does give you the tools for you to specialize, and that you’ll have to become an expert in your particular field in your own time. David A. Kennedy ’10 said that working with clients helps with time-management and introduces you to a broader work of working with others in an agency-type setting. Along with Allie and Andrew Mauney ‘12, he stressed networking. Allie was one of the students who did an internship during the spring semester, and she suggested finding an area where you want to work and then trying to build a network in that region. Brittany Ison ’12, who works in Burlington, reiterated many of the things our professors have told us: that putting in the extra hour or two on a project will make a big difference, especially when it comes to our portfolio, and in the end, that’s what matters. Above all, the alums emphasize one thing: learning. For Lou Tuffillaro ’12, his capstone project was an exercise in execution and planning for deadlines. For Caitlin Smith ‘11, it was about process. Mitch Donovan ’11 echoes a tagline often used in iMedia marketing: “You learn how to learn.” While we may not be saying that exact phrase, we know what he means: tutorials, Googling, talking to others, using what resources we have, and experimentation. Wherever we’re headed, we all know that interactive media is always being redefined. Not just the tools and the technology, but even accepted best practices and established theories. We’re being prepared to recognize when they are and how to adapt. One of the many things the iMedia program prides itself on is that it’s more than technology. The program emphasizes soft skills like presentation and group work just as much as it does learning how to take photographs or shooting video. Of course, most of us are veterans, in some way or another, of working in groups – the American educational system has made sure of that the past twenty years. But now it’s just a part of the process. We work in pairs. We work in threes, fours, fives and sixes. Occasionally we get to pick a partner, but sometimes Flash randomly generates our group. Either way, we’re going to get to know how to work with at least one person in our cohort well. Group work, of course, brings its own challenges and stresses. Especially when there are people in the group strong in one area, it’s tempting that that person takes on the entire task, with others having little or no input. That’s both good and bad – bad because we won’t grow if we don’t experience learning something new, good if there’s one person with the energy, motivation and skill to bring it all together – but scenarios like this are often inevitable. Personal clashes are also something we all expect, even pinpointing who’s going to get mad at who over what. Whether it’s a group constantly talking over each other or an inability to reach a consensus, that’s really when Jean-Paul Sartre’s phrase “Hell is other people” comes to mind. Making everyone feel included is important, too. Many of our group projects involve a lot of different, complex components, and these projects are designed to be impossible for one, or sometimes two people, to do well in the time frame given. Sometimes one personality is so dominant that others merely let him lead the way. Other times there’s a laggard – someone without much experience or motivation. How to make sure that everyone is pulling his or her own weight? Everyone should feel included – not only will this alleviate resentful feelings, but boost morale and lead to a higher functioning group, and hopefully a better project. Juanita Wrenn’s strategy is to have “each person focus on their personal strength. That puts each member in their creative comfort zone.” If two or more people are working on similar things, she tries to find a similar aesthetic so that a consensus can be reached. Obviously, each person brings their own personality to a group. The best way to deal with others? Know yourself and adapt. After all, as our professors remind us, teamwork is how it’s done. I was only two days into Bootcamp when my hand started bothering me. Oh no, I thought, as I rubbed my wrist, flashing back three years to a workplace-related injury. By the end of the week, I was frantic. My entire right arm was hurting me. An old injury had resurfaced with a vengeance, but I knew there was no way I’d ever be able to get through this computer-heavy program with this much pain, let alone the next week. I, like the rest of my iMedia cohort, knew when I chose this program it was going to be intense. Studying interactive media, obviously, and living in the twenty-first century, my classmates and I knew it was going to involve a lot of time sitting in front of a computer, editing, tweaking, designing. But we didn’t quite realize that the nature of the program was going to mess with our bodies. The piles and piles of homework seemed never-ending – the only way to get through it was to take it one day at a time. There was always something to read, a project to work on, a dreaded Flash assignment to start, and many of us felt that we could barely keep up. And then our advisors and professors would remind us about portfolios, conferences, competitions, outside projects and job searching tactics, which only served to work us up into another tizzy. To say we were stressed is laughable. Stress is par for the course here. But we also were in pain. Eye strain. Sore backs. Numb fingers. The lack of sleep and odd eating habits weren’t helping, certainly, but that’s part of school. The pain, which was too common and too frequent to be an aberration, is not. With our tight schedules – five classes, a seminar and a workshop for the first half of the semester – finding time to exercise was tough. But several students, myself included, realized that we needed that breather. “I handle everything by eating sweets and exercising twice a week. Counterproductive, kind of, but it works for me,” said Dioni Wise, who takes Zumba classes in Greensboro, where she lives, twice a week. She also added that her commute gives her some down time where she can’t work on work, even if she is just sitting in a car. Other students, like Ruth Eckles, say that the commute – she drives from Durham – is relaxing because it forces her to step away from the madness and focus on something else. However, that’s not a real break. She quickly noticed that she was stressing herself out. “Working so hard in the program, I pretty much dropped all my personal self-care regimen (eating well, exercising, getting enough sleep, being social with friends), telling myself ‘there’s no time!’ Over time, this has caused my anxiety to escalate and as a result, it felt harder to concentrate, and I just felt physically and emotionally bad. I could tell if I kept it up, I was heading for a serious case of depression. I knew I needed to nip that in the bud and be more proactive. So I basically have just been making myself do all those things I tell myself there’s no time to do: I work out, I get enough sleep,” she said. Beringer and Eckles have the right idea. Even though our 10 months here gives us the feeling that there’s never enough time to devote to everything we want to do, we need to fit in exercise breaks, even if it is just a walk around campus. Those walks stimulate thoughts, open up our mind and can lead to inspiration or a breakthrough in a way that staring at code for ten minutes won’t. As Elon students, we also have access to a large gym, a swimming pool, and a program where $20 will get you unlimited exercise classes like yoga, Pilates, kickboxing and yes, Zumba for the whole year. If we can find time to get away, Elon is situated near some wonderful parks and hiking trails, and we aren’t far from Greensboro if we want to do some urban exploring. Keeping our bodies refreshed will help us think clearly, enabling us to focus our energy where it really matters: on our studies. Breaks are good and absolutely necessary, especially in a rigorous graduate program that leaves little time for much else. In between classes, I try to move around, taking quick strolls around campus, and I try to go for a run or do some form of sustained exercise at least once a week – my absolute minimum. As for that pain: all I needed to do was switch the mouse. Now I just have to make sure that I can teach myself to step away from the computer.